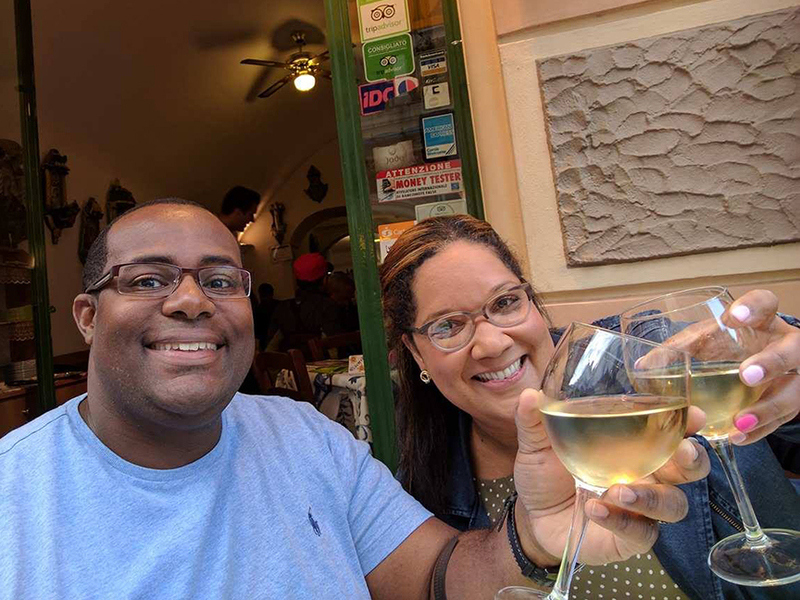 A few weeks ago, my friend and fellow Houstonian Shannen Tune (above, left, with his wife Stacey) reached out to me for advice about where to eat on a first trip to Italy. Even if you don’t live in Houston, you may know Shannen: last year, he was a winner on the Food Network’s reality show “Chopped.” He’s also a super nice guy, a beloved member of the Houston food scene, and owner of the immensely popular Craft Burger Food Truck. I was happy to share my top recommendations for Venice, Florence, and Rome. But when it came to Naples, how could I not turn to my wine blogging friend, Neapolitan sommelier, wine and food publicist, and now food sherpa, Marina Alaimo? 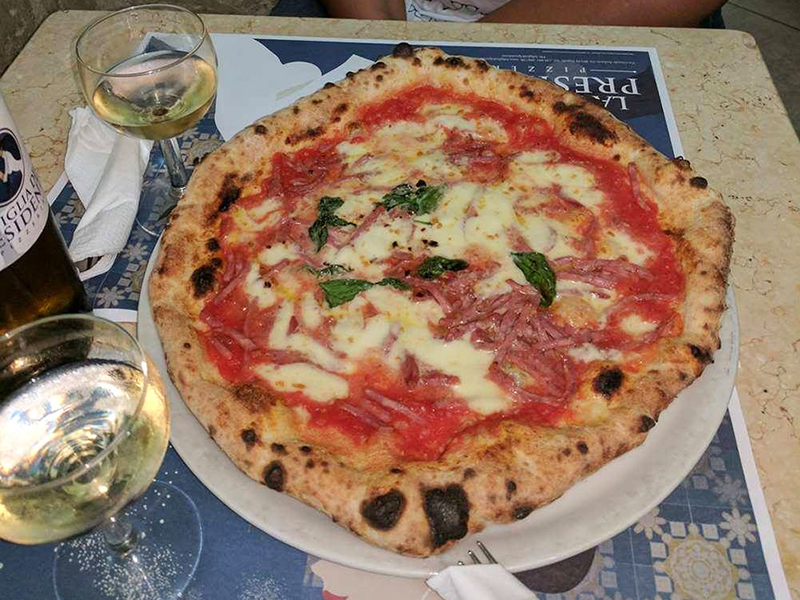 Before I knew it, Shannen was flooding my Messenger inbox with delicious images from meals with his wife in Naples, like the pizza they shared at Figlia del Presidente above. In the era of hyperconnectivity, when our overexposure to media often seems to eclipse our humanity, it fills me with joy to think that technology — and a shared love of wine and food — allowed Marina, Shannen, Stacey, and me to interact with seamless celerity. And that connection happily delivered the Houston couple to the doorstep of great enogastronomic experiences in a country and city they had never visited before. Picture my broad grin when Shannen’s messages began arriving in my inbox and I set about translating them for Marina! Marina, who has helped me out on numerous occasions when I needed a food and wine connection in Naples, is now expanding her work as a wine and food publicist to include food sherpa services. She doesn’t have a blog yet but you can nearly always find her on Facebook (Marina Alaimo). Right now, she’s excited about a new hamburger (above) by her client, Neapolitan amburgheria Sciuè il Panino Vesuviano (amburgheria is Italian for hamburger joint). Commonly used in the pleonastic and reduplicative expression sciuè sciuè, the word sciuè means in a jiffy in Neapolitan (from the Latin fluens, meaning flowing or fluent [in the literal sense]). It’s a pretty common name for street food venues in Naples, from what I understand. You could (roughly) translate the name of this sandwich shop as Vesuvian panini in a jiffy. The new hamburger is named Totò le Mokò, after the famous 1949 film by Neapolitan genius comedian and actor Totò, who died 50 years ago this April. 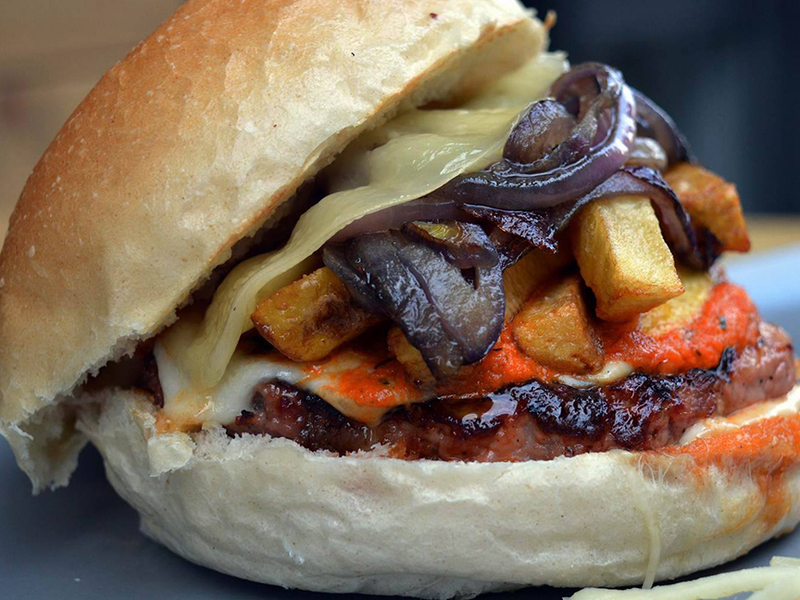 If you haven’t been to Italy lately, you may not know that hamburger mania and the street food craze have taken the country by storm in recent years. From where I stand, it seems that Shannen should feel right at home in Naples, right? From Houston to Naples, wine blogging brings us together. ← Meeting the real astronauts… what an emotional and moving experience!